The Company-X men and women sound like the team of comic book characters whose popularity led to a series of big screen outings. Have you heard of the Company-X men and women? The Company-X men and women are actually a team of real-life software superheroes. 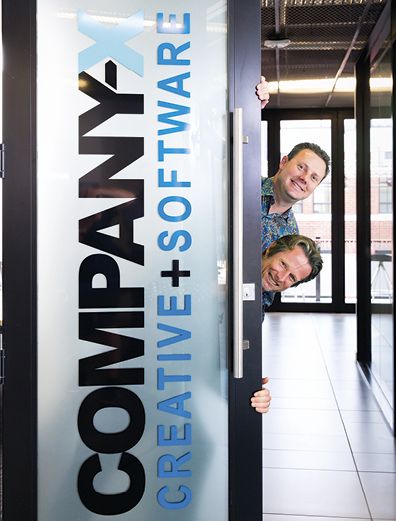 Both Jeremy and David had built very successful software development businesses of their own when they decided there was super strength in numbers. Together, they would build a business capable of winning work in Silicon Valley. They formulated founding values to guide them. • Do what you said you would do. • Make the client look good. • The client has the right to informed choice. COMPANY-X DIRECTORS: Jeremy Hughes below David Hallett. The Company-X men and women love solving clients’ business problems through developing award-winning software that smashes the problems their clients bring to them. Super software makes Company-X clients look good within their own business and with their clients. It was also the second consecutive year that Company-X’s supersonic growth registered on the Deloitte Technology Fast 500 index and was in the Deloitte Fast 50, named the fastest growing technology company in the Central North Island. “Company-X focuses on client value,” Jeremy says.